SUMMARY: A young woman from Iran comes to the US, goes to college, marries an American man and becomes a scientist. After many years in the U.S. she begins to feel her life is sterile here and returns to Iran in the search of her past, what she has left behind. And what she finds. THE BACK STORY: I had reached a stage in my life that I felt I didn’t know where I really belong, felt foreign in both the US and Iran, the country I came from. I wanted to shape those feelings in a character in my novel. WHY WOULD SOMEONE WANT TO READ IT? I think anyone who has questions about their identity, or just likes to read novels with cross-cultural issues, intermarriages, etc. would like reading it. V.S. Naipaul: “An accomplished Iranian novel. Foreigner avoids political comment. Its protest is more oblique, the political constriction drives the passion deeper, and the novel with all its air of innocence, is a novel of violation, helplessness and defeat.” — Among the Believers. 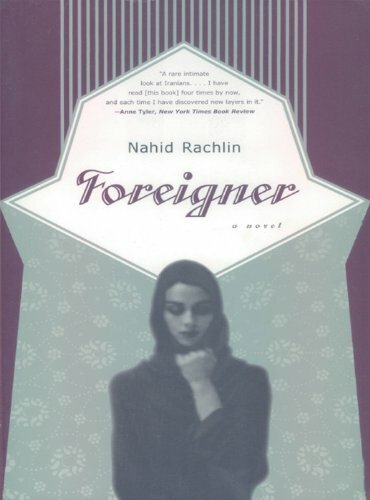 AUTHOR PROFILE: Nahid Rachlin went to Columbia University Writing Program on a Doubleday-Columbia Fellowship and then went on to Stanford University writing program on a Wallace Stegner Fellowship. Her publications include a memoir, PERSIAN GIRLS (Penguin), four novels, JUMPING OVER FIRE (City Lights), FOREIGNER (W.W. Norton), MARRIED TO A STRANGER (E.P.Dutton-Morrow), CROWD OF SORROWS, a novella, (Kindle Singles). She has a new short story collection, A WAY HOME, in press (Ravenna Press) Fall 2018. SAMPLE CHAPTER: Go to Amazon page. PRICE: Various prices on my books, in paperback and kindle and some still available in hardcover.